If you have customers or clients that eschew certain blooms because of seasonal allergies, suggest they try out our new Double Sensation. With a growing popularity throughout the country, pollen-free lilies are a viable option for those who suffer through the spring and summer from the pollen that is produced by many other perennials and bulb plants. This newcomer produces no pollen, so it's perfect for planting anywhere in the landscape, even close to entryways and below windows. The rich rose-red blooms feature snowy white centers (unusual for semi-double lilies) and are long lasting in the garden or vase. A semi-double variety, Double Sensation produces big, ornate blooms that are perfect for borders, beds and bouquets. 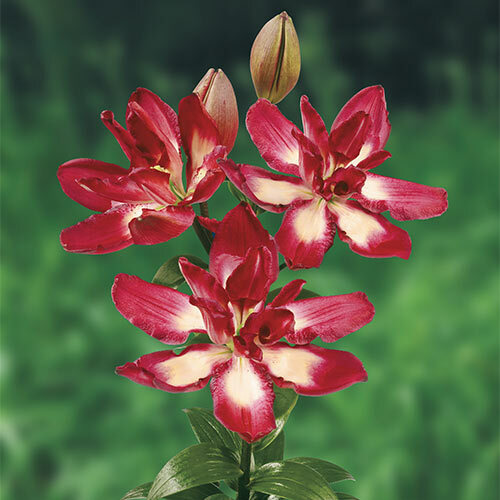 This lily perennializes well, so your customers can enjoy the beautiful blossoms year after year.